Sutherland Shire Cooking School is owned and operated by Yvonne Baldan. "My passion for cooking started long before becoming a Qualified Chef. I owe my love of baking to my mother and my grandmother. Their love of fresh produce and farming background has been instilled in me since I was a young child. Taking fresh ingredients and turning them into delicious desserts and meals excites me. I love experimenting with new flavours and recipes. Whether baking at home with my boys or teaching a professional class, I still love spending my days in the kitchen and take this sense of fun and love into our classes." A proficient Recipe Writer for Shopping Centres, including Food Styling for Magazines and Digital Media, Yvonne creates start up Menus writing for Hospitality Businesses across Australia. Her Clients include New Hotels, Pubs, Restaurants and Cafes or those wishing to take their business to the next level and improve their presence in the industry. Yvonne owns and runs Sutherland Shire Cooking School teaching leisure classes for home cooks of all levels. 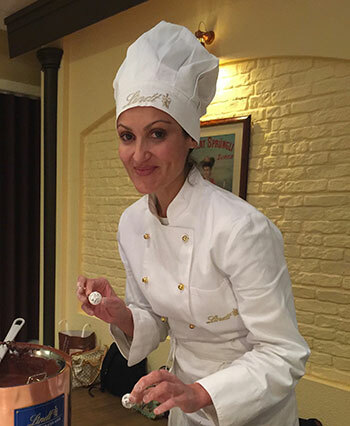 Initially training as a Chocolatier, Yvonne travelled overseas where she furthered her Chocolate studies at Valhrona Chocolate School in the South of France and later in Canada. Many years of culinary studies in Australia were spent honing her skills in French Pastry, Provincial French Cooking, Chocolate and Professional Dessert Courses. Adding a Diploma of Hospitality Management to her belt and winning a Leadership Award in her industry in 2016, she still maintains direct contact with students and teaches most of the classes herself. The dedicated owner keeps her classes modern by teaching up to date culinary food trends in her industry and is also a qualified Raw and Plant Food Chef. Further studies in Raw Desserts led her to becoming a Certified Raw Desserts Chef.